External affairs minister Sushma Swaraj on Wednesday ruled out talks with Pakistan saying “terror and talks” could not go together. “How can we think about holding talks (with Pakistan) when the firing on the border continues,” Swaraj told newspersons in Lucknow. She was replying to a question if the Centre would consider inviting people of Pakistan in the forthcoming Pravasi Bharatiya Divas (PBD) 2019, scheduled at Varanasi during 21-23 January. Meanwhile, Swaraj had arrived in the state capital to review the preparations for the mega event, which would be formally inaugurated by Prime Minister Narendra Modi on January 22. President Ram Nath Kovind would grace the closing ceremony on January 23. 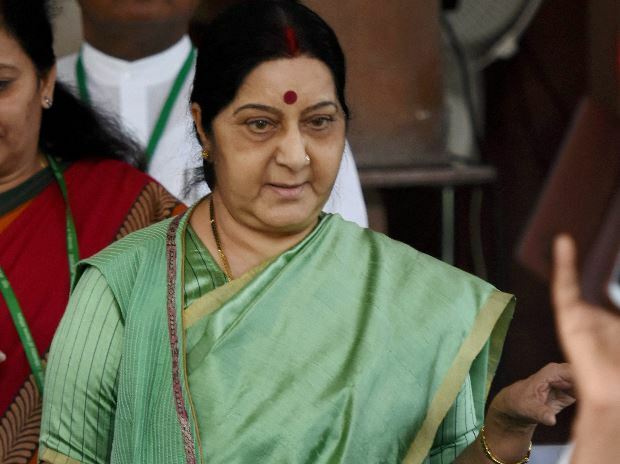 “So far, about 5802 registrations have been done by the NRIs and People of Indian Origin (PIO) who desire to attend the Pravasi Bharatiya Divas,” Swaraj informed. Mauritian Prime Minister Praveen Kumar Jagannath is the chief guest of the biennial event. Since, Kumbh 2019 is also underway at Prayagraj (Allahabad), the visitors would also be taken there. A dance performance by actor and Mathura Member of Parliament (MP) Hema Malini would also be organised on January 22. After the closing ceremony, the visitors would be taken to New Delhi for a visit around the national capital on January 25, while they would witness the Republic Day celebrations on January 26. Uttar Pradesh chief minister Yogi Adityanath thanked Modi and Swaraj for selecting Varanasi for holding this edition of PBD. UP government is also holding its UP NRI Divas simultaneously with PBD on January 21, in which about 1,000 NRIs and PIOs of UP origin are expected to attend. “We have made elaborate arrangements for visitors, including a tent city comprising Swiss cottages and home stays at the residences of local people of Varanasi, who have volunteered to host the NRIs and PIOs,” he added. “We are also preparing an expansive cultural village to showcase our culture and heritage starting from the Indus Valley Civilization,” Adityanath said adding it was the first time that the NRIs would be exposed to the rich heritage of both Varanasi and Prayagraj, which would provide a “divine experience” to visitors.